Braces can be a long, involved process, but gaining a more attractive smile and better oral health is worth it. Sometimes, though, braces can produce unintended short-term consequences. Brace brackets and wires do the work of moving teeth to better positions. They can, however, hinder the wearer's hygiene efforts to remove plaque, a thin film of bacteria and food particles, from tooth surfaces. Plaque buildup increases the risk of dental disease and other ill effects. One such effect while you're wearing braces is the formation of tiny spots that look pale and chalky on otherwise smooth and polished enamel. These are white spot lesions (WSLs), where acid has remained for too long on the tooth enamel. They occur because acid-producing bacteria escape removal during brushing and flossing due to the braces hardware. 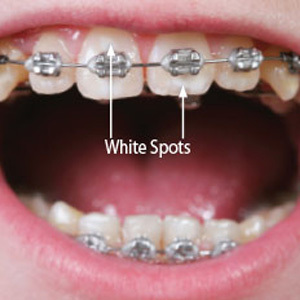 We want to try to prevent WSLs while wearing braces, and not just because they're unattractive. You're actually looking at enamel erosion, which could lead to cavity development at those weakened spots. Although difficult for you as a braces wearer, daily brushing and flossing is crucial to WSL prevention. You'll need to take more time to be sure you're reaching all around the wires and brackets. You can improve your effectiveness with special brushes for braces and floss threaders or water irrigators. You can also help keep acid levels low by cutting back on acidic foods and beverages, especially sodas, coffee or spicy foods. Even if you develop WSLs we can treat them effectively, especially if caught early. One way is by aiding enamel re-mineralization through saliva stimulation (the mouth's acid neutralizer) or applying fluoride to the teeth to strengthen enamel. We can also use caries infiltration, a technique that injects tooth-colored resin below the surface of the lesion. This strengthens the weakened enamel and gives the area the appearance of translucence like normal enamel. While you're wearing braces, focus diligently on keeping your teeth clean of plaque and keep up your regular cleaning visits with us. If you notice any unusual discolorations or abnormalities, see us as soon as possible. Stopping WSLs from developing will help ensure your teeth are healthy and attractive after the braces come off.